Have you noticed the trend these days to seize upon the January price markdowns to acquire those gifts that somehow failed to show up under the tree on Christmas morning? I know I’ve contemplated it a bit….Kids, too, aren’t immune to this desire—often lobbying for that one little thing that they didn’t receive, even if they got most all they’d wished for. This year that item is Wii Fit, which didn’t Fit into our holiday budget. All in my family got plenty of lovely gifts, though, so Wii Fit would have to wait for the coffers to be replenished. At least that’s what I thought until, on the day after Christmas, we visited my brother-in-law’s house and my teens became captivated by their game. Normally, kids being fixated on a video game is reason enough not to purchase it. Who wants their children to be perpetually tuned out, clamoring for the controllers, spending all waking hours in pursuit of mindless video game obsession? But Wii Fit actually has a purpose: to eliminate the sedentary nature of gaming, at least to some degree. And this piqued my interest: if it could motivate kids to work out, might it also impel slacker middle-aged moms bored with their normal exercise routine to get off their butts and exercise more? So I struck a deal with my kids: since everyone wanted it so badly, we’d split the cost and get one as a post-holiday motivator. Which seemed like a great idea, until my sister-in-law Martha exposed the ugly truth about the game: the game platform—the Wii balance board—is actually a scale. As in: the thing that I’ve been hiding in my closet for years with the notion that out of sight is out of mind and thus can’t be true. Denial thy name is Jenny. Martha went on to tell me that not only does the balance board accurately and undeniably determine your weight (probably more so than the precise scales they use to glean poundage of each item loaded onto the Space Shuttle), but the higher your BMI (body mass index), the fatter you Wii “Mii” icon gets. Seriously. So to add insult to injury, you have a Tubby Tessa avatar staring back at you from the television screen. Can we get more humiliated? It’s like a chase-me-beat-me workout. Or maybe that hairbrush spanking for getting a D in handwriting in second grade (not that that ever happened, mind you). To me, exercise really should not be mortifying, it should be gratifying. And a public flogging was not what I signed up for. So my grand plans to get on board the Wii Fit train were immediately keboshed. Yet I’d already committed to spending my own cash to help buy the damned thing, which has led to all sorts of scheming on my part to circumvent this unpleasant, uh, shall we say, side effect of the game. Fortunately necessity is still the mother of invention, especially when it comes to truths about which we choose to remain blissfully ignorant (despite those rotten harbingers of reality that are unavoidable, such as tight jeans). And I’ve got a plan: I’m going to make one of my kids (or perhaps one of my dogs) mount the board in my stead each time I use the game in order to get set up with the dreaded “body test,” and then I will simply ignore the taunting evidence: Wii Fit telling me I’ve got the fitness stamina of a great-grandmother, for instance. I’ll just do my thing, flap my arms, hula my hips, or whatever other silly games they have that will make me actually move, and not worry about the true number of calories burned or exact fitness level. I felt a reprieve from the guilt when I saw on Twitter a number of other women whose children had gotten Wii Fit for Christmas also trying to figure out how to outwit the scale dilemma. Clearly when evolving Wii Fit Plus into Wii Fit Plus Plus, the Nintendo engineers should consider the vanity of women world-wide and provide a way to turn off the scale temporarily, or at least, as we all do with the elliptical machine at the gym, simply lie and enter in 120 pounds when asked our weight. Does this diminish the point to the game? Well, sort of. But can it enable me to remain cloaked in ignorance and retain some faux dignity where I so choose? You bet. Wii Fit? No way! Wii Fat is more like it, at least if the public weigh-in is the only “weigh” to go. And in that case, this little piggy might just go wii wii wii all the way back to the gym, where I can easily lie about my weight when the exercise equipment demands an answer. Jenny, I had this on my Amazon wishlist, and think dh was going to buy, LOL — then I told him about this. I agree with you — this kind of negative feedback does nothing to encourage fitness, it’s reflecting a distorted body image that I assume has the intention of motivating since your Mii would get smaller as you lose weight, but what if losing weight is not the goal? I would like to lose 10lbs, but even at that, I will not be thin, and neither would my Mii. And what about an overweight child who wants to use the game, what kind of message does this Wii Fat imaging communicate? It’s terrible. I think that should be an optional element, and we should let Nintendo know so. My mother got the Wii for Christmas and my sister left her copy of Wii Fit for Momma to try out. She got over the weight thing. Actually, it seems to motivate her to lose. In the two weeks since she started using it, she’s worked out for an hour each day, without fail. She’s already lost 4 pounds. Plus she buttoned and zipped a pair of jeans she couldn’t get close two weeks ago. Momma is nearly 71 so I guess old dogs can learn new tricks. LOL And become addicted to them! I told Lil Sis she’ll have to buy herself a new Wii Fit. Momma’s not giving it up! I love my Wii. You can set the weigh in info to private if you don’t want anyone reading it. Though, you can’t change that Mii character pudge thing. It’s kept me motivated… I want my Mii to look good, lol. If you have someone else weigh in for you, it will call you on it before every game, saying that the weight for that character is off. LOL!!! 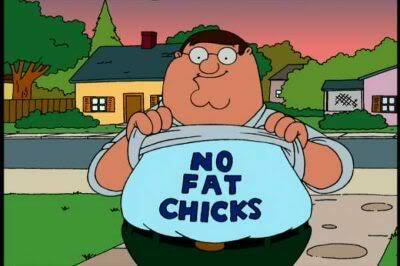 You have me in stitches with that NO FAT CHICKS shirt on a chubby man… HILARIOUS! I need a laugh… thank you! don’t ya love that? thanks!